Intellasia East Asia News - N KoreaKorea diplomacy flourishes, but what about Kim Jong Un's nukes? N KoreaKorea diplomacy flourishes, but what about Kim Jong Un’s nukes? 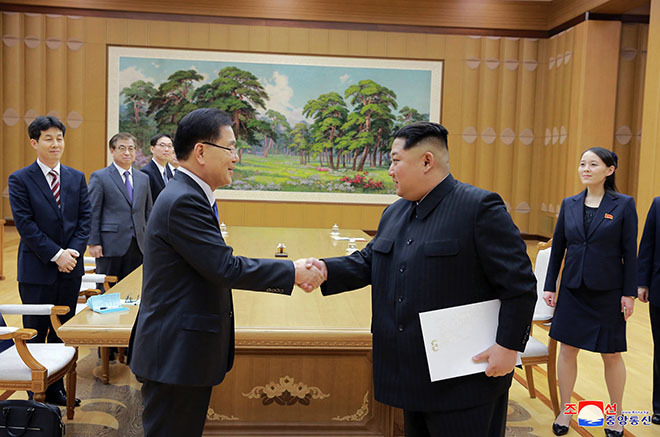 North and South Korea continued their push for peace Monday with high-level talks that resulted in a host of agreements, including a plan by the rivals for a groundbreaking ceremony this year on an ambitious project to connect their railways and roads. The agreements come amid unease in Washington over the speed of inter-Korean engagement. Many outsiders believe that US-led efforts to rid North Korea of its nuclear-tipped missiles are lagging significantly behind the Koreas’ efforts to move past decades of bitter rivalry. They also announced measures to reduce conventional military threats, such as creating buffer zones along their land and sea boundaries and a no-fly zone above the border, removing 11 front-line guard posts by December, and demining sections of the Demilitarised Zone. South Korean Foreign minister Kang Kyung-wha also said US Secretary of State Mike Pompeo expressed displeasure about the Koreas’ military agreements. Kang was not specific, but her comments fueled speculation that Washington wasn’t fully on board before Seoul signed the agreements. Trump has encouraged US allies to maintain sanctions on North Korea until it denuclearises to maintain a campaign of pressure against Kim’s government.